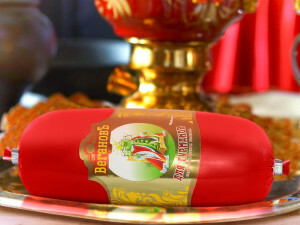 Vegetarian sausage gluten-free “For gourmans” | Компания «Вегановъ» – вегетарианские продукты питания. New in the line of sausage brand “Veganov.” Made of high quality pea and soy protein. Recommended for people leading an active lifestyle. Sausage “Gourmet” is the leader among vegetarian sausages on the amount of protein. It contains the whole complex of essential and nonessential amino acids. Suitable for people with celiac disease. Ingredients: pea protein, soy protein, extra-first cold pressed Virgin olive oil, sunflower oil, inulin from chicory, sea salt, allspice, muscat, natural dye “beetroot”, ascorbic acid, rosemary extract, licorice extract, seaweed polysaccharides, locust bean gum. Generally, we know a little about the benefit of peas. For us it is just ordinary food. However, the pea is not so simple. Even in medieval Europe it was considered a staple of healthy diet. In our time, scientists have studied the positive properties of the protein contained in peas, and found that it can help prevent hypertension and kidney disease. Pea protein can delay the onset of kidney disease in people with hypertension, as well as increase the life expectancy for those who already suffer from kidney disease. Amino acids, which are the part of this culture, are similar to animal protein but absorbed by the body much more effectively. Pea is a very powerful antioxidant, therefore it is used as the prevention of cancer. Pea is very useful as a means for preventing obesity and anemia. It helps to improve the functioning of the heart, blood vessels, liver. Doctors recommend peas to patients who suffer from gastric ulcer, as it lowers the acidity perfectly. Thiamin helps to improve the functioning of the brain and the body’s energy supply. Eating peas is also very useful for children and adolescents. It stimulates growth, maintains normal muscle tone and a healthy appetite, gives a favorable effect on mental ability. For adults thiamine slows the aging process, protects cells from the damaging action of bad habits (alcohol and smoking). This culture contains vitamins: PP, A, H, K, E and C, and beta-carotene. Mineral substances include such macronutrients as phosphorus, potassium, calcium, magnesium, boron, silicon, chromium, selenium …. There’s no need to write a lot about benefits of soy protein. People, who lead an active life style and interested in health and right diet, know, that soy protein is a valuable product, a biologically valuable and easily digestible. It contains all the essential amino acids in the ratio, that is necessary for the person. All unique components are contained in soybean: lecithin, flavonoids, iron, saponin, phytic acid, vitamins, trace elements, etc. Rosemary extract is obtained from the leaves of shrub Rosmarinus officinalis L., Labiatae family – Labiatae, by water extraction followed by concentration and drying. Rosemary extract (rosmanol, carnosic acid) has the cascade ability to update vitamin E, and is also involved in the cascade of carnosic acid. As soon as the antioxidant molecule of carnosic acid “has caught” a free radical, it changes its structure and becomes a carnosol. Carnosol also “catches” free radicals and change again, transformed into rosmanol. Rosmanol continues to “catch” radicals, turns into galdozol, realizing cascade continuous process. The extract of licorice has a lot of useful micro and macronutrients, vitamins and minerals. Among these items we can allocate such elements as glycyram, polysaccharides, resins, oils, alkaloids and triterpenoids. Licorice is a veritable treasure trove of organic acids, which include fumaric, tartaric, malic and citric acid. Oriental Medicine recommends to add liquorice in meals for the elderly people to prolong life. Licorice in its qualities similar to ginseng – known for its medicinal properties. Inulin – daily usage of inulin as a prebiotic leads to substantial increasing of the number of bifidobacteria in the gut, thereby improving the intestinal flora by inhibiting the development of pathogenic viruses and fungi, respectively increasing immunity. Seaweed polysaccharides contain a complex of biologically active substances and minerals (K, Ca, Mg, S, Si, P, J, Fe, Ba, etc. ), the spectrum of vitamins (A, B1, B2, OT, B6, B12, C, D E, K, P, H et al. ), rich in organically bounded iodine and selenium.